Creating a desirable environment in the attic seems like a constant battle sometimes, doesnâ€™t it? During summer, the air in this room is often too hot, and in winter the air is noticeably too cold. The problem is often poor insulation coupled with poor ventilation. Installing roof exhaust vents helps take care of the ventilation issue throughout the attic space. 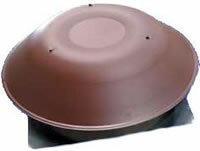 Roof exhaust vents are an important part of an efficiently working system of attic ventilation. During the hotter months of the year, excessive heat build-up in an attic with inefficient ventilation can easily become a 150 degree problem. During months of extreme cold, the problem becomes condensation. Roof exhaust vents work with proper intake to continuously provide fresh air which removes the moisture and excessive heat that is caused by the unwanted stale air. In addition to increasing air quality in the attic, the 8-inch by 8-inch aluminum roof exhaust vents include an aluminum screen to block animals from entering the home through the attic and a rain-guard for protection against inclement weather.